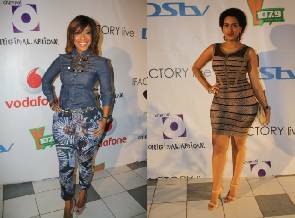 Home / joselyn dumas / juliet ibrahim / news / #GJNEWS: Who is the real ‘Miss Hippie’…Juliet or Joselyn? #GJNEWS: Who is the real ‘Miss Hippie’…Juliet or Joselyn? Juliet Ibrahim and Joselyn Dumas have always been said to be part of the few female celebrities from Ghana gunning for the accolade of ‘Miss Hippie’, an imaginary award for the most endowed hip in the industry. By all standards , both Juliet and Joselyn are show stoppers because of what they possess. Their hips cannot be overlooked even if you try to do so. Their hips truly don’t lie. Recently at the launch of Channel O’s new entertainment show O News Live’ which went down at The Silver Star Tower , Accra, Ghana, Juliet and Joselyn caught the lenses of all paparazzi with their HIPS. They came in full glare with their curves on full display. Now the questions is who has the sexiest hips and who would you love to date?